This year Motorola has launched the latest updates to its G-series, the Moto G7 smartphone range, which were publicised earlier this month. However, those waiting for a foldable to rival designs from the likes of Samsung, Huawei, and Royale might be a bit disappointed by Moto's foldable no-show at MWC 2019. 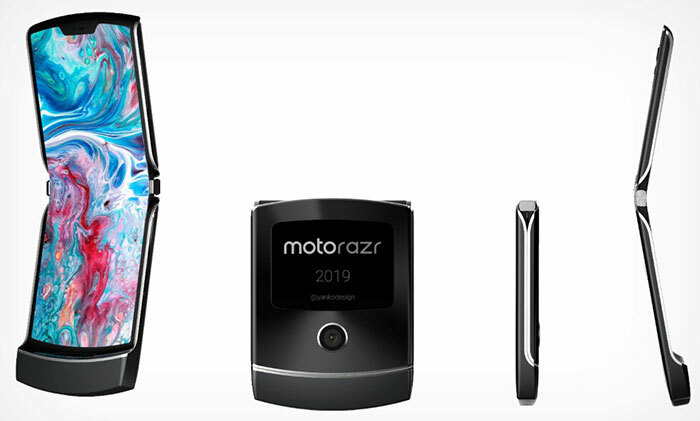 We saw patents of a next-gen Moto RAZR-like folding smartphone back in January but nothing of the sort was even teased at the mobile tech event which closes its doors today in Barcelona. Tempering our disappointment somewhat, Motorola VP of Global Product Dan Dery talked to Engadget about his company's plans for foldables and offered some reassurances. "We started to work on foldables a long time ago and we have been doing a lot of iteration," Dery asserted in an interview. 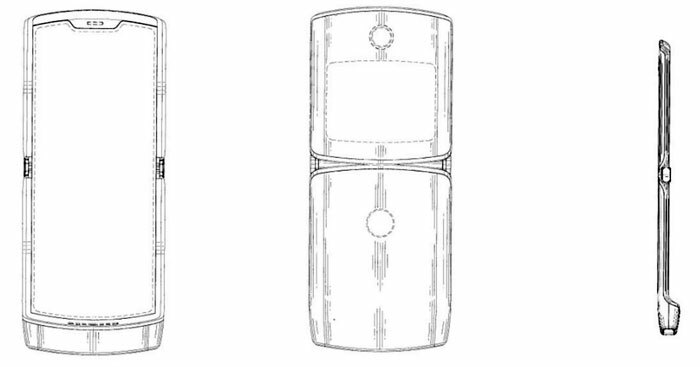 As the chat progressed, Dery seemed to confirm that the patent images of a Moto RAZR-like folding smartphone were pretty much in line with what one might expect from a first Moto foldable smartphone. Dery led the interviewer down this path by pointing out the desirable nature of using the folding mechanism to keep the screen in pristine condition, rather than a design where the main screen would rapidly get scratched to the point that it affects usability. Moto probably isn't going to pin all its hopes onto one design though. Dery highlighted the appeal of a tri-fold design where a single screen folds twice to leave just a third of the display exposed in phone mode. He went on to hint that he knew several other device makers who were looking at tri-fold and Z-fold options now - but thought they would be facing too many technical hurdles over the short term to enter the foldable fray. Moto's schedule for its first foldable release wasn't pinpointed. However, Dery said that Motorola has "no intention of coming later than everybody else in the market." This statement indicates that Moto's first foldable effort(s) will be released in a similar timeframe to Samsung (April) and Huawei (mid-2019) foldable devices - so we should see a launch in the coming weeks and release by summer at the latest. All rendered images by Sarang Sheth. 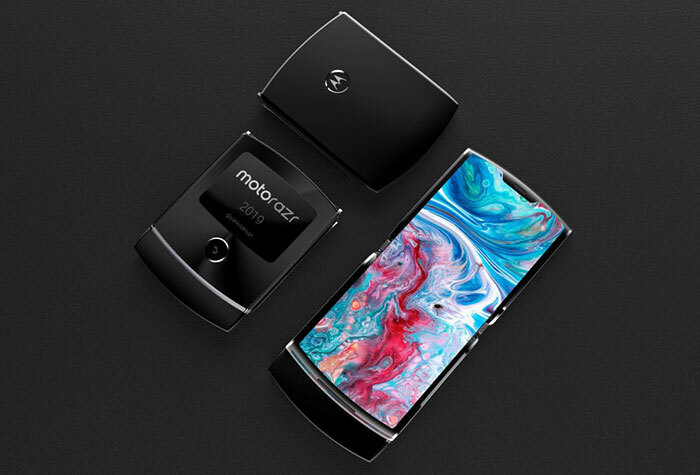 Samsung launches Galaxy A80 with rotating triple camera Pair of Google Pixel 3a phones spotted in Play Store leak Quartet of Motorola G7 smartphones launched Motorola patent reveals RAZR-like foldable smartphone QOTW: Which mobile phone do you use? A more interesting foldable to me, protected from the swarf in my pocket at work. Indeed, I'm not a fan of the phones that fold the other/wrong way for the fact the screen is exposed. Not well aware of capabilities or possible issues with these folding phones so I wouldn't trust them yet. It will be interesting to see how easy these folding screens are scratched. The glass cover on the back of my phone is heavily scratched by dust and dirt that has gotten behind its protective case. I would think these soft flexible screens would be even worse and good luck using a screen protector!